Secondo rinforzo coreano per i tailandesi del Muangthong United FC: è in arrivo l’attaccante 25enne Choe Kum-Chol. Si aggiunge a Ri Kwang-Chon, titolare fisso della squadra e capitano della nazionale. Posted in Senza categoria and tagged ri kwang chon, choe kum chol on giugno 30, 2012 by calciocorea. Grazie alla vittoria per 3-0 contro i ragazzi coreani hanno conquistato la qualificazione al prossimo campionato asiatico under-22. Qualificata anche la Cina, dopo il pareggio con la Tailandia. Posted in Senza categoria and tagged nazionale under 22 on giugno 30, 2012 by calciocorea. Prima rete stagione per Pak Kwang-Ryong nell’amichevole contro l’FC Rottach-Egern, chiusa con un tondo 10-0. L’attaccante del Basilea ha sbloccato il risultato al 7′ del primo tempo. 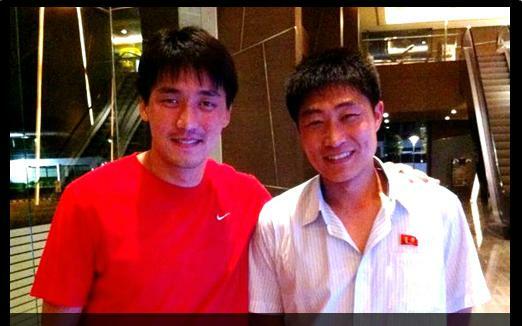 Posted in Senza categoria and tagged pak kwang ryong on giugno 29, 2012 by calciocorea. Ormai siamo ad un passo per la qualificazione all’AFC U22-2014. Basterà non perdere contro la Cambogia per la qualificazione. Vittoria con il minimo vantaggio contro il fanalino di coda Hong Kong. Decide un gol di KIM JIN HYOK al 51′. Posted in Senza categoria on giugno 28, 2012 by calciocorea. Martedì scorso amichevole tra le nazionali Under-19 di Corea Popolare e Cina al Yanggakdo Football Stadium di Pyongyang. L’incontro è terminato con uno spettacolare 3-3. Le due squadre si stanno preparando per il Campionato asiatico U19, che si giocherà negli Emirati Arabi a novembre. Posted in Senza categoria and tagged nazionale under 19 on giugno 27, 2012 by calciocorea. Posted in Senza categoria and tagged nazionale under 22 on giugno 25, 2012 by calciocorea. Prima partita e prima vittoria per i coreani contro la Thailandia nel girone di qualificazione per l’AFC U22. Posted in Senza categoria and tagged nazionale under 22 on giugno 24, 2012 by calciocorea. Posted in Senza categoria and tagged pak kwang ryong on giugno 22, 2012 by calciocorea. Pyongyang, June15 (KCNA) — The Sports Contest for Pochonbo Torch Prize closed with due ceremony in Nampho on Friday. The contest opened on June 3 to mark the 75th anniversary of the victory in the Pochonbo battle. Men footballers of the Ri Myong Su Sports Team and women footballers of the Amnokgang Sports Team won the titles and men players of the April 25 Sports Team and women players of the Amnokgang Sports Team took the first place in volleyball matches. Men players of the Pyongyang Railway Bureau Sports Team and women players of the Waudo Sports Team respectively came first in the field hokey events and men and women players of the April 25 Sports Team in the boxing events. Posted in Senza categoria and tagged dpr korea league on giugno 15, 2012 by calciocorea. Pyongyang, June 14 (KCNA) — Among the sportspersons who have contributed to the development of women’s football in the Democratic People’s Republic of Korea is Kim Kyong Hui, a coach of the Amnokgang Sports Group. The women’s football team led by her placed first in the national premier league soccer matches, recently held as part of the Sports Contest for Pochonbo Torch Prize. At the beginning of women’s football in the country, she played a forward and a captain of the football team in the Sports Group. She contributed to gaining silver medal for the DPRK at the 9th Asian Women’s Football Championship. During her career of 10 odd years as a coach, Kim has trained many footballers well known at home and abroad. Among them are Hong Myong Gum, O Kum Hui, Ri Jong Sim and Ri Yong Mi, who distinguished themselves in taking the titles of the 2006 U-20 Women’s World Cup and the 1st U-16 Asian Women’s Football Championship for the country. She has also been active as an international football referee since 2002. Kim told KCNA that she would devote herself to turning the DPRK into a football power by steadily improving her ability. Posted in Senza categoria and tagged dpr korea league on giugno 14, 2012 by calciocorea.